COBB Tuning Exhaust - Stainless Steel Y-Pipe NISSAN - Dezod Motorsports Inc - Home of the automotive performance enthusiast since 2002. 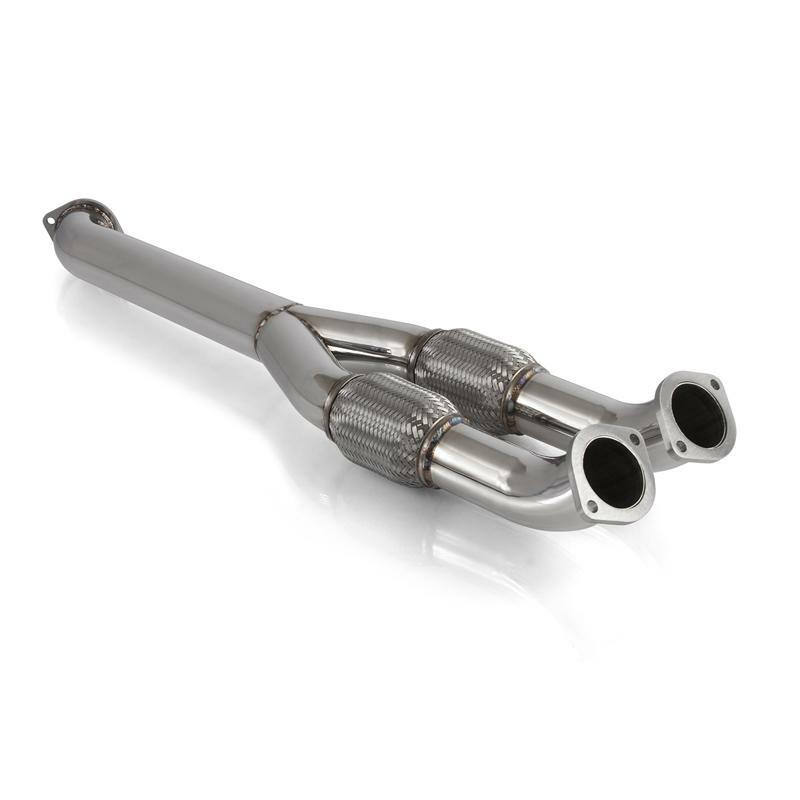 COBB Tuning is pleased to announce the COBB 3.5-inch Stainless Steel Y-Pipe for the Nissan GT-R. The stock y-pipe with factory catalytic converters is a restrictive element in the GT-R’s exhaust system. The COBB 3.5-inch SS Y-Pipe is offered in both catless and high-flow cat versions that reduce exhaust restriction and allow the GT-R to make more power with less effort. The catted version of the COBB 3.5-inch SS Y-Pipe uses custom-spun high-flow metal substrate catalytic converters that improve flow while protecting the environment by reducing emissions. The catless racing y-pipe is for off-road use only and deletes the catalytic converters entirely, further improving flow and allowing even more power. Both the catted and catless versions of the COBB 3.5-inch SS Y-Pipe are constructed of 304 stainless steel and TIG welded. The stainless steel flex sections are internally-lined for added lifespan and smoother exhaust flow. Dual 3-inch downpipes feed into a 3.5-inch main pipe. The Y-pipe is designed as a direct factory replacement part. The following dyno chart compares a stock un-tuned Nissan GT-R, a stock Nissan GT-R with an AccessPORT Stage 1 tune, and a Nissan GT-R with the catless Y-Pipe and AccessPORT tune. At peak power, 28 HP and 46 ft/lb is gained with the catless y-pipe over Stage 1. Gains of up to 50HP can be found in the midrange. Power gains are similar between the catless and catted versions when using the stock GT-R turbos. Unleash the beast hidden within your Nissan GT-R with the new COBB 3.5″ SS Y-Pipe and the COBB AccessPORT.